James Wesley Edwards, Ph.D., died peacefully at home with his family on June 18, 2018. Born in Evansville, IN (1938); BA Evansville College (1960); Ph.D. Utah State University (Zoology) (1964). He was preceded in death by his wife, Mrs. Laura Crossan Nicholson Edwards, of 38 years, who died on October 14, 2008. He was also preceded in death by eleven Harley-Davidsons. Exceeding all of the expectations in his life, he never caused physical, military, or political damage to his homeland or to any land or peoples. As a Professor of Biology for 27 years (Salem College), he was most grateful for his Zoology, Genetics, Human Genetics, and Evolution students, who at least tolerated his humor. 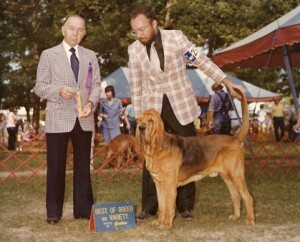 Additionally, his contributions in the world of dogs, especially Bloodhounds, are recorded, as are his contributions, lasting a decade, to the American Kennel Club as Director – Judging Research and Development/DNA Operations. His judging assignments of many canine breeds included shows throughout the United States; Stratford-Upon-Avon & Birmingham, England; the Netherlands; Bern, Switzerland; and Hangzhou and Beijing, China. He is survived by his son/family, FBI Special Agent Lance W. Edwards and Mrs. Melody Edwards (Sandy UT), grandchildren Wesley and Abigail; Mr. Sterling and Mrs. Erica Nicholson III (Danbury), grandson Mr. Sterling and Mrs. Stephanie Nicholson IV; Mrs. Taddy and Mr. David Nunn (Bluffton SC); Mrs. Sally and Mr. Arnie McCullers (Newport News VA), granddaughter Mrs. Riley Shaia (husband Dr. Wayne Shaia), and great-grandchildren Allison, Adam, and Nicholas (Richmond VA); grandson Mr. Ross and Mrs. Tara Bynam (Midland TX), and great-grandchildren Asher and Noah; and granddaughter Ms. Molly Bynam (Richmond). He greatly appreciated the continuing support of his family after the loss of his wife. He enjoyed a wonderfully pain-free life: arriving by C-section (his mother Letha Eunice led a similar life and died in 2005 at 109 years of age), professionally existing as an educator, retiring with specialties in family, purebred dogs, the derivatives of Pilsen Bohemia, and Harleys, and finally exiting painlessly without medical assistance when the spirits ran dry. Dr. Edwards frequently expressed his gratitude for all of his friends at the College, at the AKC, and especially in the world of purebred dogs – including a prince of this world, Mr. Wayne Cavanaugh. Continuing his lectures . . . he reminds us that Sir Bertrand Russell was correct . . . “When you die, you . . . “ (do your homework). Cheers. All the Best. His remains have been sent to the Medical School for the education of tomorrow’s doctors. Time to drink — and celebrate your life! Posted by chesliepickett on Jun 24 2018. Filed under Breaking News, Featured. You can follow any responses to this entry through the RSS 2.0. Both comments and pings are currently closed.